Mason Ottersberg and Max Gerston at the 3rd round of the Western Hare Scrambles series; Jordan Ashburn, Mike Witkowski, and Rachel Gutish at the 3rd round of the GNCC series! -Mason Ottersberg placed 4th at round 3 of the WHS series aboard his 430RR Race Edition. -Max Gerston caught a cold the night before the West Hare Scramble event and was unable to race at 100%, but still managed to gain some points for the series totals. "On Wednesday morning I decided last minute to go race in Gorman after seeing pictures on social media about the upcoming rain. I was honestly just looking to show up to get some race seat time, and see where I stacked up. After struggling to find a flow from a dead last start, I was able to basically come from 16th all the way up to 4th place by the end of the 8 laps." "Gorman didn't exactly go as planned. I was hit with some sort of flu the day before with gnarly stomach pains. The next day it was all I could do to get geared up for the race. I was able to race the first two laps, but then I was hit with stomach pains super hard. I raced another few laps so I could at least card a finish. As of now I plan on resting up in preparation for the race in Idaho next weekend." Course Conditions: Scattered showers with occasional mud pits and loamy soil. -Jordan Ashburn placed 6th in the XC1 class at round 3 of the GNCC and is currently in 12th place overall. -Mike Witkowski finished in 17th in the XC2 class after a freak mechanical issue forced him to pit for a repair. -Rachel Gutish placed 3rd in the WXC class at round 3 of the GNCC and is currently sitting in 3rd place for the season standings. "The General GNCC started off pretty well for me. I was able to make a pass for 4th going into the 3rd lap. The track was very rough and had tons of lines. There were lots of lapped riders as well. I found myself in 5th place on the 4th lap just 21 seconds from the leader. We were all really close all day but the leaders were able to sneak away the last two laps. I finished 6th place for the day. I'm definitely gonna build on this and reach that podium!" "I got off to a near holeshot on my Beta 250 RR. I went into the woods 2nd. Then a little bit later my bike started to bog. I was trying to figure out the problem but couldn't diagnose it. Once I got back to the pits and we got the bike fixed I was about an hour down from the lead group and dead last overall. I charged on and didn't give up. I came back to 17th in my class." "I am happy to have repeated last round's performance, earning another WXC podium finish for Beta. I have always enjoyed The General, and I'm glad that the series returned to the property and reestablished the round. Despite a bad start and some issues throughout the day, I was able to quickly recover to a 4th place finish by the end of the first lap. From there I continued to charge and on the final lap moved into 3rd place. The course was a blast and I am looking forward to the next round in a few weeks!" Max Gerston Takes his 1st win at Mt. Baker West Hare Scramble! Last weekend was packed with action in the West Hare Scramble. Max Gerston took his first ever victory allowing him to take the series points lead. A small heat wave hit Bellingham, WA on Saturday with highs reaching over 90 degrees. The heated air helped dry up the weathered ridden track that was impacted by a storm the previous week. The mixture of heat and wet ground made for a grueling race that lasted over two and a half hours. Max held the lead the entire race, putting a two minute gap between him and second place finisher Joey Fiasconaro by the third lap. Max later told us "After a bad start, I was able to set a good pace and put some distance between me and my competitors as I knew they would be charging hard." After the race Max said, "It feels good to get that monkey off my back and I want to keep the ball rolling for the rest of the year." 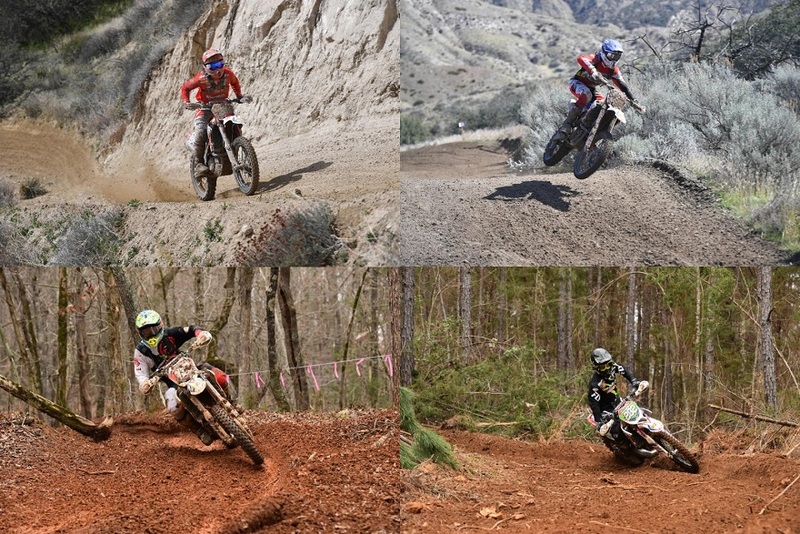 About 2,800 miles away in Snowshoe, West Virginia a battle for the 8th round of GNCC took place. The track conditions at the event were almost perfect with a rain storm that past through a week before the race, and the temperature at around 75 degrees. However, there were some sections thick with mud that made the track a little brutal to ride. Jordan Ashburn stated,"I started in the second row 10 secs behind the first row. I made a couple mistakes the first lap picking bad lines. I worked all day trying to recover from that, and I feel like I could have been on the podium. "Jordan ended up finishing in fourth place in the XC1 class coming from 10th place in lap one. With the points he earned from getting 4th place at Snowshoe, Jordan is seated 5th place in the overall points standing, which is only 3 points ahead of 6th place Trevor Bollinger. With such a tight points gap the next few races will be exciting to watch as the season end closes in. At the same event Beta USA rider Nick Davis placed 8th, while his teammate Drew Higgins placed 12th in the XC2 250 Pro class. Nick was running in 5th place when his rear brake pedal snapped off making him stop for a quick pit. "The team got it changed fast and got me back out there. I came from 12th and ended up in 8th, and just made the top 20 over all."